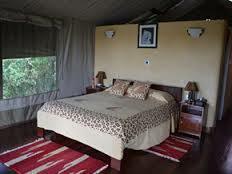 This Kenya Lodge Safari offers the best of Kenya's sights and scenery, visiting the scenic Amboseli to see large herds of elephants roaming with Kilimanjaro towering in the background, beautiful Lake Naivasha against the backdrop of the Mount Longonot volcano, the famous flamingoes and rhinos of Lake Nakuru, and the unrivalled wildlife spectacle of the Masai Mara Reserve. Wildlife Highlights include lion, elephant, buffalo, leopard, cheetah, hippos, crocodiles, wildebeest, zebra, antelope species, giraffe, black and white rhino. This Highlights of Kenya Budget Lodge Safari offers excellent value‐for‐money providing the most variety possible over the shortest time. Set against the magnificent backdrop of Africa's highest mountain, the glittering Mount Kilimanjaro, Amboseli Serena Safari Lodge enjoys a uniquely privileged position at the heart of this world-famous national park. Secluded within a grove of acacia trees, the lodge looks out over the golden savannah plains, with uninterrupted views of the mountain itself. Close by are a series of emerald green swamps, which are fed by the melting snows of Kilimanjaro. These, the only sources of water in this otherwise starkly beautiful but arid park, attract huge numbers of wallowing elephants, hippos, buffalos and plains game. Meanwhile, from the prehistoric site of Observation Hill, the sunset over Kilimanjaro is magnificent. At the centre of ‘Maasailand', the lodge's décor reflects the brilliant primary colours and iconic shapes representative of these legendary warriors. At the heart of the lodge, shaded by palm trees, is a free-form swimming pool; to either side of which stretch the rooms. Each room is housed in a single storey building opening directly on to the grounds, each reflecting a Maasai Manyatta theme: each with its own hand-painted wall frescos. The central dining area is reached by a timbered bridge over a melt-water stream, while the lounge and bar feature a broad terrace and a blazing fire-pit where evening cocktails can be enjoyed. Activities include daily game drives in custom-built traditional safari vehicles, ‘sundowners' on Observation Hill, bush breakfasts, bush dinners, Maasai dance performances, visits to Maasai villages and tree-planting Programmes. Kilaguni Serena Safari Lodge Superbly situated in the lee of Mount Kilimanjaro and sheltered by the volcanic splendour of the Chyulu Hills, this classic stone-built lodge overlooks its own water hole, which is visited daily by elephants, buffalos and a wide variety of plains game. One of the first lodges ever to be built in a national park, the lodge is cool, tranquil and hushed for optimum game-viewing. It is also ideally placed for visits to all the park's prime attractions. Faced in volcanic stone and utilizing the natural rocky outcrops of a valley known as ‘the place of the young rhino', from which it takes its name, the lodge features a thatched central dining area and a rock-built bar, with a viewing terrace looking directly down on to the waterhole. All the spacious ensuite rooms have their own verandas, some overlooking the waterhole, some the Chyulu Hills, which are one of the world's youngest volcanic ranges. As for activities, the lodge offers numerous game drives, guided walks, bush breakfasts, volcano climbs and trips to Mzima Springs, a set of crystal-clear ponds, fed by the melt waters of Mount Kilimanjaro, in which the many hippos can be viewed from a submerged chamber. Kilaguni Serena Safari Lodge is located within the Tsavo West National Park ( a short drive from the main Mtito Andei Gate), which lies 280 kilometres from Nairobi. Mara Serena Safari Lodge Located at the very centre of the famous ‘Mara Triangle' of the world-renowned Masai Mara National Reserve, the Mara Serena Safari Lodge is the ultimate safari destination. Set high on a bush-cloaked hill with long views over the savannah and down to the winding coils of the hippo-filled Mara River, it stands centre-stage to one of Africa's most dramatic wildlife arenas, with a ringside seat for the ‘greatest wildlife show on earth', the legendary migration of the wildebeest. Styled to echo the circular motif of a traditional Maasai Manyatta, the lodge blends international sophistication with raw African beauty, while featuring twin rows of individual rooms, each with its own view of the famous Mara River. The central bar and dining areas enjoy spectacular views, as does the rock-surround swimming pool. Each uniquely-presented room is accommodated in its own stand-alone modular unit, with uninterrupted views, private balcony and spacious seating area. Activities include two daily game drives in custom-built traditional safari vehicles, ‘sundowners' in the bush, breakfast by the hippo pool, lunch in the wilderness, dinner in the bush, balloon safaris or relaxation and reinvigoration in the panoramic new Maisha Safari Spa and Gym. World renowned for the breathtaking spectacle of ‘the greatest wildlife show on earth', the awe inspiring annual migration of the wildebeest, the Mara is Kenya's most visited protected area. Technically an extension of Tanzania's renowned Serengeti National Park, the Mara constitutes only 4% of the entire Serengeti ecosystem but its rolling grasslands, meandering rivers and towering escarpments offer one of the world's most rewarding and evocative wildlife arenas. Visit Kenya’s finest game parks on this eight-day overland journey. Visit Kenya's amazing natural sights by day and in the evenings, kick back in the comfort of a well-appointed lounge or private tented camp and fall asleep to the sounds of nocturnal animals. Watch Kenya's abundant flamingos make Lake Nakuru blush pink; pass herds of animals on the vast plains of the Masai Mara; and enjoy night-time wildlife encounters at the famous lodges - the ultimate Kenya lodge safari experience. You'll head home invigorated by the perfect combination of adventure and relaxation. Saruni Samburu’s six luxury, eco-chic villas are open and spacious, heralding spectacular views over Kalama Conservancy and Mount Kenya. As the only lodge in over 200,000 acres of unspoiled wilderness teeming with wildlife to explore exclusively, and guided by Samburu warriors passionate about their land and culture, the safari experience at Saruni Samburu is intimate and truly exceptional.